Sport, community and identity in South Sydney: the context of rugby league. Women seeking to enter the domain of what are considered traditional male sports are often subjected to criticism, ridicule and fierce opposition. women announced their intention to stage a rugby league match. emphasis on the strong opposition it encountered. and the place of women within the sport and culture of rugby league. I was awarded the Tom Brock Scholarship whilst I was undertaking my PhD in the School of History at the University of New South Wales. My dissertation focused on the relationships between sport, race, gender and ethnicity in South Sydney, with a particular focus on rugby league. The scholarship provided financial assistance in completing my PhD thesis (which was later published as Through Thick and Thin: The South Sydney Rabbitohs and their Community [Walla Walla Press, 2009]). It also allowed me to produce a journal article on women’s rugby league in 1920s Sydney, which was published in the refereed journal Football Studies and later featured in an ABC radio Hindsight documentary in 2009.
rugby league players for the ASSH publication that marked the centenary of rugby league in Australia. Additionally, I have presented papers on rugby league at academic conferences in Japan, Slovenia, Scotland, England and the United States. 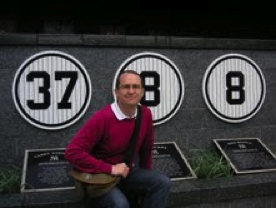 My most recent research projects have seen me turn my attention to aspects of sport within Asia, and I have contributed to a number of leading academic titles related to this field (including serving as regional editor for Asia for the ABC-Clio Project Sports History Around the World: History, Culture, Practice, a major three-volume project that has become a key global reference work for sports history). As well as my teaching and research, I have also worked as a consultant for the Islamic Federation of Women’s Sport to develop best practice within the management of women’s sport in Iran. Ayatollah (?) 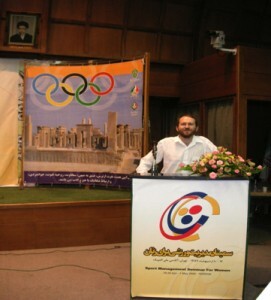 Charles Little, consultant for the Islamic Federation of Women’s Sport to develop best practice within the management of women’s sport in Iran.